This chapter defines the processing model for tables in CSS. Part of this processing model is the layout. For the layout, this chapter introduces two algorithms; the first, the fixed table layout algorithm, is well-defined, but the second, the automatic table layout algorithm, is not fully defined by this specification. For the automatic table layout algorithm, some widely deployed implementations have achieved relatively close interoperability. Table layout can be used to represent tabular relationships between data. Authors specify these relationships in the document language and can specify their presentation using CSS 2.2. In a visual medium, CSS tables can also be used to achieve specific layouts. In this case, authors should not use table-related elements in the document language, but should apply the CSS to the relevant structural elements to achieve the desired layout. Authors may specify the visual formatting of a table as a rectangular grid of cells. Rows and columns of cells may be organized into row groups and column groups. Rows, columns, row groups, column groups, and cells may have borders drawn around them (there are two border models in CSS 2.2). Authors may align data vertically or horizontally within a cell and align data in all cells of a row or column. This code creates one table (the TABLE element), three rows (the TR elements), three header cells (the TH elements), and six data cells (the TD elements). Note that the three columns of this example are specified implicitly: there are as many columns in the table as required by header and data cells. Note, however, that the borders around the rows overlap where the rows meet. What color (black or blue) and thickness (1px or 3px) will the border between row1 and row2 be? We discuss this in the section on border conflict resolution. We discuss the various table elements in the following section. In this specification, the term table element refers to any element involved in the creation of a table. An internal table element is one that produces a row, row group, column, column group, or cell. The CSS table model is based on the HTML4 table model, in which the structure of a table closely parallels the visual layout of the table. In this model, a table consists of an optional caption and any number of rows of cells. The table model is said to be "row primary" since authors specify rows, not columns, explicitly in the document language. Columns are derived once all the rows have been specified -- the first cell of each row belongs to the first column, the second to the second column, etc.). Rows and columns may be grouped structurally and this grouping reflected in presentation (e.g., a border may be drawn around a group of rows). Thus, the table model consists of tables, captions, rows, row groups (including header groups and footer groups), columns, column groups, and cells. Specifies that an element defines a block-level table: it is a rectangular block that participates in a block formatting context. Specifies that an element defines an inline-level table: it is a rectangular block that participates in an inline formatting context). Specifies that an element is a row of cells. Specifies that an element groups one or more rows. Like 'table-row-group', but for visual formatting, the row group is always displayed before all other rows and row groups and after any top captions. Print user agents may repeat header rows on each page spanned by a table. If a table contains multiple elements with 'display: table-header-group', only the first is rendered as a header; the others are treated as if they had 'display: table-row-group'. Like 'table-row-group', but for visual formatting, the row group is always displayed after all other rows and row groups and before any bottom captions. Print user agents may repeat footer rows on each page spanned by a table. If a table contains multiple elements with 'display: table-footer-group', only the first is rendered as a footer; the others are treated as if they had 'display: table-row-group'. Specifies that an element describes a column of cells. Specifies that an element groups one or more columns. Specifies that an element represents a table cell. Specifies a caption for the table. All elements with 'display: table-caption' must be rendered, as described in section 17.4. Replaced elements with these 'display' values are treated as their given display types during layout. 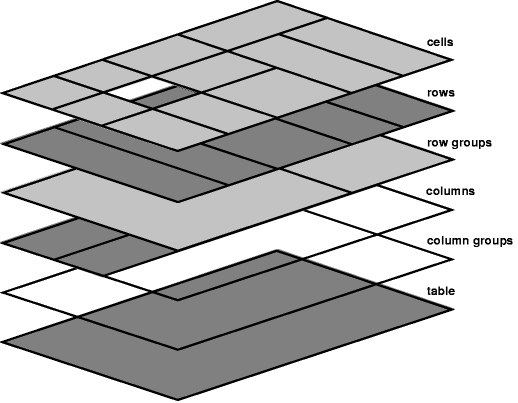 For example, an image that is set to 'display: table-cell' will fill the available cell space, and its dimensions might contribute towards the table sizing algorithms, as with an ordinary cell. Elements with 'display' set to 'table-column' or 'table-column-group' are not rendered (exactly as if they had 'display: none'), but they are useful, because they may have attributes which induce a certain style for the columns they represent. User agents may ignore these 'display' property values for HTML table elements, since HTML tables may be rendered using other algorithms intended for backwards compatible rendering. However, this is not meant to discourage the use of 'display: table' on other, non-table elements in HTML. A 'table-row' box, row group box, 'table-column' box, 'table-column-group' box, or 'table-caption' box. A 'table-cell' box, 'table-row' box, row group box, 'table-column' box, or 'table-column-group' box. Two sibling boxes are consecutive if they have no intervening siblings other than, optionally, an anonymous inline containing only white spaces. A sequence of sibling boxes is consecutive if each box in the sequence is consecutive to the one before it in the sequence. For the purposes of these rules, out-of-flow elements are represented as inline elements of zero width and height. Their containing blocks are chosen accordingly. The following steps are performed in three stages. All child boxes of a 'table-column' parent are treated as if they had 'display: none'. If a child C of a 'table-column-group' parent is not a 'table-column' box, then it is treated as if it had 'display: none'. If a child C of a tabular container P is an anonymous inline box that contains only white space, and its immediately preceding and following siblings, if any, are proper table descendants of P and are either 'table-caption' or internal table boxes, then it is treated as if it had 'display: none'. A box D is a proper table descendant of A if D can be a descendant of A without causing the generation of any intervening 'table' or 'inline-table' boxes. If a box B is an anonymous inline containing only white space, and is between two immediate siblings each of which is either an internal table box or a 'table-caption' box then B is treated as if it had 'display: none'. If a child C of a 'table' or 'inline-table' box is not a proper table child, then generate an anonymous 'table-row' box around C and all consecutive siblings of C that are not proper table children. If a child C of a row group box is not a 'table-row' box, then generate an anonymous 'table-row' box around C and all consecutive siblings of C that are not 'table-row' boxes. If a child C of a 'table-row' box is not a 'table-cell', then generate an anonymous 'table-cell' box around C and all consecutive siblings of C that are not 'table-cell' boxes. For each 'table-cell' box C in a sequence of consecutive internal table and 'table-caption' siblings, if C's parent is not a 'table-row' then generate an anonymous 'table-row' box around C and all consecutive siblings of C that are 'table-cell' boxes. A 'table-row' is misparented if its parent is neither a row group box nor a 'table' or 'inline-table' box. A 'table-column' box is misparented if its parent is neither a 'table-column-group' box nor a 'table' or 'inline-table' box. A row group box, 'table-column-group' box, or 'table-caption' box is misparented if its parent is neither a 'table' box nor an 'inline-table' box. Table cells may belong to two contexts: rows and columns. However, in the source document cells are descendants of rows, never of columns. Nevertheless, some aspects of cells can be influenced by setting properties on columns. The various border properties apply to columns only if 'border-collapse' is set to 'collapse' on the table element. In that case, borders set on columns and column groups are input to the conflict resolution algorithm that selects the border styles at every cell edge. The background properties set the background for cells in the column, but only if both the cell and row have transparent backgrounds. See "Table layers and transparency." The 'width' property gives the minimum width for the column. If the 'visibility' of a column is set to 'collapse', none of the cells in the column are rendered, and cells that span into other columns are clipped. In addition, the width of the table is diminished by the width the column would have taken up. See "Dynamic effects" below. Other values for 'visibility' have no effect. Here are some examples of style rules that set properties on columns. The first two rules together implement the "rules" attribute of HTML 4 with a value of "cols". The third rule makes the "totals" column blue, the final two rules shows how to make a column a fixed size, by using the fixed layout algorithm. In terms of the visual formatting model, a table can behave like a block-level (for 'display: table') or inline-level (for 'display: inline-table') element. In both cases, the table generates a principal block container box called the table wrapper box that contains the table box itself and any caption boxes (in document order). The table box is a block-level box that contains the table's internal table boxes. The caption boxes are principal block-level boxes that retain their own content, padding, margin, and border areas, and are rendered as normal block boxes inside the table wrapper box. 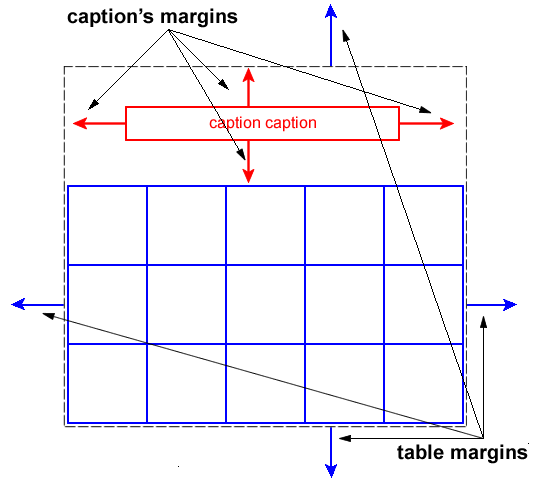 Whether the caption boxes are placed before or after the table box is decided by the 'caption-side' property, as described below. The table wrapper box is block-level for 'display: table', and inline-level; for 'display: inline-table'. The table wrapper box establishes a block formatting context, and the table box establishes a table formatting context. 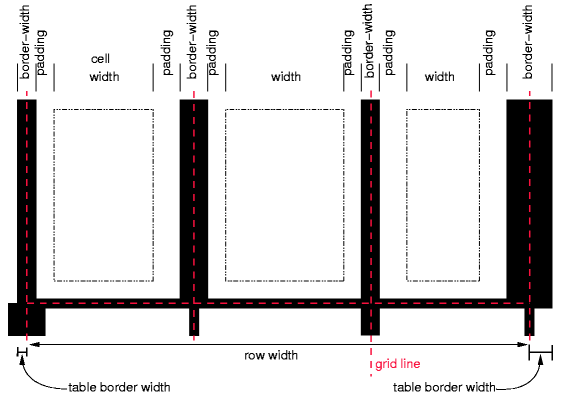 The table box (not the table wrapper box) is used when doing baseline vertical alignment for an 'inline-table'. The width of the table wrapper box is the border-edge width of the table box inside it, as described by section 17.5.2. Percentages on 'width' and 'height' on the table are relative to the table wrapper box's containing block, not the table wrapper box itself. Diagram of a table with a caption above it. Positions the caption box above the table box. Positions the caption box below the table box. Note: CSS2 described a different width and horizontal alignment behavior. That behavior will be introduced in CSS3 using the values 'top-outside' and 'bottom-outside' on this property. To align caption content horizontally within the caption box, use the 'text-align' property. In this example, the 'caption-side' property places captions below tables. The caption will be as wide as the parent of the table, and caption text will be left-justified. Internal table elements generate rectangular boxes which participate in the table formatting context established by the table box. These boxes have content and borders and cells have padding as well. Internal table elements do not have margins. The visual layout of these boxes is governed by a rectangular, irregular grid of rows and columns. Each box occupies a whole number of grid cells, determined according to the following rules. These rules do not apply to HTML 4 or earlier HTML versions; HTML imposes its own limitations on row and column spans. Each row box occupies one row of grid cells. Together, the row boxes fill the table from top to bottom in the order they occur in the source document (i.e., the table occupies exactly as many grid rows as there are row elements). A row group occupies the same grid cells as the rows it contains. A column box occupies one or more columns of grid cells. Column boxes are placed next to each other in the order they occur. The first column box may be either on the left or on the right, depending on the value of the 'direction' property of the table. A column group box occupies the same grid cells as the columns it contains. A cell box cannot extend beyond the last row box of a table or row group; the user agents must shorten it until it fits. Note. Positioning and floating of table cells can cause them not to be table cells anymore, according to the rules in section 9.7. When floating is used, the rules on anonymous table objects may cause an anonymous cell object to be created as well. User agents are free to visually overlap the cells, as in the figure on the left, or to shift the cell to avoid the visual overlap, as in the figure on the right. Two possible renderings of an erroneous HTML table. For the purposes of finding the background of each table cell, the different table elements may be thought of as being on six superimposed layers. The background set on an element in one of the layers will only be visible if the layers above it have a transparent background. The lowest layer is a single plane, representing the table box itself. Like all boxes, it may be transparent. The next layer contains the column groups. Each column group extends from the top of the cells in the top row to the bottom of the cells on the bottom row and from the left edge of its leftmost column to the right edge of its rightmost column. The background covers exactly the full area of all cells that originate in the column group, even if they span outside the column group, but this difference in area does not affect background image positioning. On top of the column groups are the areas representing the column boxes. Each column is as tall as the column groups and as wide as a normal (single-column-spanning) cell in the column. The background covers exactly the full area of all cells that originate in the column, even if they span outside the column, but this difference in area does not affect background image positioning. Next is the layer containing the row groups. Each row group extends from the top left corner of its topmost cell in the first column to the bottom right corner of its bottommost cell in the last column. The next to last layer contains the rows. Each row is as wide as the row groups and as tall as a normal (single-row-spanning) cell in the row. As with columns, the background covers exactly the full area of all cells that originate in the row, even if they span outside the row, but this difference in area does not affect background image positioning. The topmost layer contains the cells themselves. As the figure shows, although all rows contain the same number of cells, not every cell may have specified content. In the separated borders model ('border-collapse' is 'separate'), if the value of their 'empty-cells' property is 'hide' these "empty" cells are transparent through the cell, row, row group, column and column group backgrounds, letting the table background show through. A "missing cell" is a cell in the row/column grid that is not occupied by an element or pseudo-element. Missing cells are rendered as if an anonymous table-cell box occupied their position in the grid. Table with empty cells in the bottom row. Note that if the table has 'border-collapse: separate', the background of the area given by the 'border-spacing' property is always the background of the table element. See the separated borders model. CSS does not define an "optimal" layout for tables since, in many cases, what is optimal is a matter of taste. CSS does define constraints that user agents must respect when laying out a table. User agents may use any algorithm they wish to do so, and are free to prefer rendering speed over precision, except when the "fixed layout algorithm" is selected. Note that this section overrides the rules that apply to calculating widths as described in section 10.3. In particular, if the margins of a table are set to '0' and the width to 'auto', the table will not automatically size to fill its containing block. However, once the calculated value of 'width' for the table is found (using the algorithms given below or, when appropriate, some other UA dependent algorithm) then the other parts of section 10.3 do apply. Therefore a table can be centered using left and right 'auto' margins, for instance. Future updates of CSS may introduce ways of making tables automatically fit their containing blocks. The two algorithms are described below. With this (fast) algorithm, the horizontal layout of the table does not depend on the contents of the cells; it only depends on the table's width, the width of the columns, and borders or cell spacing. The table's width may be specified explicitly with the 'width' property. A value of 'auto' (for both 'display: table' and 'display: inline-table') means use the automatic table layout algorithm. However, if the table is a block-level table ('display: table') in normal flow, a UA may (but does not have to) use the algorithm of 10.3.3 to compute a width and apply fixed table layout even if the specified width is 'auto'. A column element with a value other than 'auto' for the 'width' property sets the width for that column. Otherwise, a cell in the first row with a value other than 'auto' for the 'width' property determines the width for that column. If the cell spans more than one column, the width is divided over the columns. Any remaining columns equally divide the remaining horizontal table space (minus borders or cell spacing). The width of the table is then the greater of the value of the 'width' property for the table element and the sum of the column widths (plus cell spacing or borders). If the table is wider than the columns, the extra space should be distributed over the columns. If a subsequent row has more columns than the greater of the number determined by the table-column elements and the number determined by the first row, then additional columns may not be rendered. CSS 2.2 does not define the width of the columns and the table if they are rendered. When using 'table-layout: fixed', authors should not omit columns from the first row. In this manner, the user agent can begin to lay out the table once the entire first row has been received. Cells in subsequent rows do not affect column widths. Any cell that has content that overflows uses the 'overflow' property to determine whether to clip the overflow content. In this algorithm (which generally requires no more than two passes), the table's width is given by the width of its columns (and intervening borders). This algorithm reflects the behavior of several popular HTML user agents at the writing of this specification. UAs are not required to implement this algorithm to determine the table layout in the case that 'table-layout' is 'auto'; they can use any other algorithm even if it results in different behavior. Input to the automatic table layout must only include the width of the containing block and the content of, and any CSS properties set on, the table and any of its descendants. Note. This may be defined in more detail in CSS3. The remainder of this section is non-normative. This algorithm may be inefficient since it requires the user agent to have access to all the content in the table before determining the final layout and may demand more than one pass. Calculate the minimum content width (MCW) of each cell: the formatted content may span any number of lines but may not overflow the cell box. If the specified 'width' (W) of the cell is greater than MCW, W is the minimum cell width. A value of 'auto' means that MCW is the minimum cell width. Also, calculate the "maximum" cell width of each cell: formatting the content without breaking lines other than where explicit line breaks occur. For each column, determine a maximum and minimum column width from the cells that span only that column. The minimum is that required by the cell with the largest minimum cell width (or the column 'width', whichever is larger). The maximum is that required by the cell with the largest maximum cell width (or the column 'width', whichever is larger). For each cell that spans more than one column, increase the minimum widths of the columns it spans so that together, they are at least as wide as the cell. Do the same for the maximum widths. If possible, widen all spanned columns by approximately the same amount. For each column group element with a 'width' other than 'auto', increase the minimum widths of the columns it spans, so that together they are at least as wide as the column group's 'width'. This gives a maximum and minimum width for each column. The caption width minimum (CAPMIN) is determined by calculating for each caption the minimum caption outer width as the MCW of a hypothetical table cell that contains the caption formatted as "display: block". The greatest of the minimum caption outer widths is CAPMIN. If the 'table' or 'inline-table' element's 'width' property has a computed value (W) other than 'auto', the used width is the greater of W, CAPMIN, and the minimum width required by all the columns plus cell spacing or borders (MIN). If the used width is greater than MIN, the extra width should be distributed over the columns. If the 'table' or 'inline-table' element has 'width: auto', the used width is the greater of the table's containing block width, CAPMIN, and MIN. However, if either CAPMIN or the maximum width required by the columns plus cell spacing or borders (MAX) is less than that of the containing block, use max(MAX, CAPMIN). Note. In this algorithm, rows (and row groups) and columns (and column groups) both constrain and are constrained by the dimensions of the cells they contain. Setting the width of a column may indirectly influence the height of a row, and vice versa. The height of a table is given by the 'height' property for the 'table' or 'inline-table' element. A value of 'auto' means that the height is the sum of the row heights plus any cell spacing or borders. Any other value is treated as a minimum height. CSS 2.2 does not define how extra space is distributed when the 'height' property causes the table to be taller than it otherwise would be. Note. Future updates of CSS may specify this further. The height of a 'table-row' element's box is calculated once the user agent has all the cells in the row available: it is the maximum of the row's computed 'height', the computed 'height' of each cell in the row, and the minimum height (MIN) required by the cells. A 'height' value of 'auto' for a 'table-row' means the row height used for layout is MIN. MIN depends on cell box heights and cell box alignment (much like the calculation of a line box height). CSS 2.2 does not define how the height of table cells and table rows is calculated when their height is specified using percentage values. CSS 2.2 does not define the meaning of 'height' on row groups. 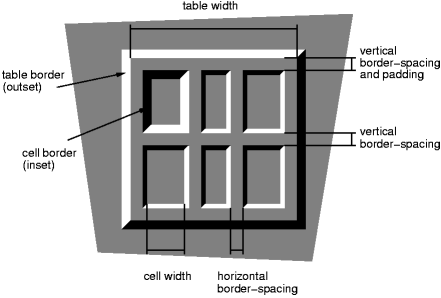 In CSS 2.2, the height of a cell box is the minimum height required by the content. The table cell's 'height' property can influence the height of the row (see above), but it does not increase the height of the cell box. CSS 2.2 does not specify how cells that span more than one row affect row height calculations except that the sum of the row heights involved must be great enough to encompass the cell spanning the rows. The baseline of the cell is put at the same height as the baseline of the first of the rows it spans (see below for the definition of baselines of cells and rows). The top of the cell box is aligned with the top of the first row it spans. The bottom of the cell box is aligned with the bottom of the last row it spans. The center of the cell is aligned with the center of the rows it spans. These values do not apply to cells; the cell is aligned at the baseline instead. The baseline of a cell is the baseline of the first in-flow line box in the cell, or the first in-flow table-row in the cell, whichever comes first. 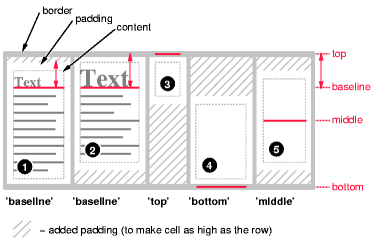 If there is no such line box or table-row, the baseline is the bottom of content edge of the cell box. For the purposes of finding a baseline, in-flow boxes with a scrolling mechanisms (see the 'overflow' property) must be considered as if scrolled to their origin position. Note that the baseline of a cell may end up below its bottom border, see the example below. Diagram showing the effect of various values of 'vertical-align' on table cells. Cell boxes 1 and 2 are aligned at their baselines. Cell box 2 has the largest height above the baseline, so that determines the baseline of the row. If a row has no cell box aligned to its baseline, the baseline of that row is the bottom content edge of the lowest cell in the row. First the cells that are aligned on their baseline are positioned. This will establish the baseline of the row. Next the cells with 'vertical-align: top' are positioned. If any of the remaining cells, those aligned at the bottom or the middle, have a height that is larger than the current height of the row, the height of the row will be increased to the maximum of those cells, by lowering the bottom. Finally the remaining cells are positioned. Cell boxes that are smaller than the height of the row receive extra top or bottom padding. The horizontal alignment of inline-level content within a cell box can be specified by the value of the 'text-align' property on the cell. The 'visibility' property takes the value 'collapse' for row, row group, column, and column group elements. This value causes the entire row or column to be removed from the display, and the space normally taken up by the row or column to be made available for other content. Contents of spanned rows and columns that intersect the collapsed column or row are clipped. The suppression of the row or column, however, does not otherwise affect the layout of the table. This allows dynamic effects to remove table rows or columns without forcing a re-layout of the table in order to account for the potential change in column constraints. There are two distinct models for setting borders on table cells in CSS. One is most suitable for so-called separated borders around individual cells, the other is suitable for borders that are continuous from one end of the table to the other. Many border styles can be achieved with either model, so it is often a matter of taste which one is used. This property selects a table's border model. The value 'separate' selects the separated borders border model. The value 'collapse' selects the collapsing borders model. The models are described below. *) Note: user agents may also apply the 'border-spacing' property to 'frameset' elements. Which elements are 'frameset' elements is not defined by this specification and is up to the document language. For example, HTML4 defines a <FRAMESET> element, and XHTML 1.0 defines a <frameset> element. The 'border-spacing' property on a 'frameset' element can be thus used as a valid substitute for the non-standard 'framespacing' attribute. The lengths specify the distance that separates adjoining cell borders. If one length is specified, it gives both the horizontal and vertical spacing. If two are specified, the first gives the horizontal spacing and the second the vertical spacing. Lengths may not be negative. The distance between the table border and the borders of the cells on the edge of the table is the table's padding for that side, plus the relevant border spacing distance. For example, on the right hand side, the distance is padding-right + horizontal border-spacing. The width of the table is the distance from the left inner padding edge to the right inner padding edge (including the border spacing but excluding padding and border). However, in HTML and XHTML1, the width of the <table> element is the distance from the left border edge to the right border edge. Note: In CSS3 this peculiar requirement will be defined in terms of UA style sheet rules and the 'box-sizing' property. In this model, each cell has an individual border. The 'border-spacing' property specifies the distance between the borders of adjoining cells. In this space, the row, column, row group, and column group backgrounds are invisible, allowing the table background to show through. Rows, columns, row groups, and column groups cannot have borders (i.e., user agents must ignore the border properties for those elements). A table with 'border-spacing' set to a length value. Note that each cell has its own border, and the table has a separate border as well. in-flow content (including empty elements) other than white space that has been collapsed away by the 'white-space' property handling. When this property has the value 'show', borders and backgrounds are drawn around/behind empty cells (like normal cells). A value of 'hide' means that no borders or backgrounds are drawn around/behind empty cells (see point 6 in 17.5.1). Furthermore, if all the cells in a row have a value of 'hide' and have no visible content, then the row has zero height and there is vertical border-spacing on only one side of the row. In the collapsing border model, it is possible to specify borders that surround all or part of a cell, row, row group, column, and column group. Borders for HTML's "rules" attribute can be specified this way. Borders are centered on the grid lines between the cells. User agents must find a consistent rule for rounding off in the case of an odd number of discrete units (screen pixels, printer dots). Here n is the number of cells in the row, padding-lefti and padding-righti refer to the left (resp., right) padding of cell i, and border-widthi refers to the border between cells i and i + 1. UAs must compute an initial left and right border width for the table by examining the first and last cells in the first row of the table. The left border width of the table is half of the first cell's collapsed left border, and the right border width of the table is half of the last cell's collapsed right border. If subsequent rows have larger collapsed left and right borders, then any excess spills into the margin area of the table. The top border width of the table is computed by examining all cells who collapse their top borders with the top border of the table. The top border width of the table is equal to half of the maximum collapsed top border. The bottom border width is computed by examining all cells whose bottom borders collapse with the bottom of the table. The bottom border width is equal to half of the maximum collapsed bottom border. Any borders that spill into the margin are taken into account when determining if the table overflows some ancestor (see 'overflow'). Schema showing the widths of cells and borders and the padding of cells. Note that in this model, the width of the table includes half the table border. Also, in this model, a table does not have padding (but does have margins). CSS 2.2 does not define where the edge of a background on a table element lies. In the collapsing border model, borders at every edge of every cell may be specified by border properties on a variety of elements that meet at that edge (cells, rows, row groups, columns, column groups, and the table itself), and these borders may vary in width, style, and color. The rule of thumb is that at each edge the most "eye catching" border style is chosen, except that any occurrence of the style 'hidden' unconditionally turns the border off. Borders with the 'border-style' of 'hidden' take precedence over all other conflicting borders. Any border with this value suppresses all borders at this location. If none of the styles are 'hidden' and at least one of them is not 'none', then narrow borders are discarded in favor of wider ones. If several have the same 'border-width' then styles are preferred in this order: 'double', 'solid', 'dashed', 'dotted', 'ridge', 'outset', 'groove', and the lowest: 'inset'. If border styles differ only in color, then a style set on a cell wins over one on a row, which wins over a row group, column, column group and, lastly, table. When two elements of the same type conflict, then the one further to the left (if the table's 'direction' is 'ltr'; right, if it is 'rtl') and further to the top wins. An example of a table with collapsed borders. Table with two omitted internal borders. Some of the values of the 'border-style' have different meanings in tables than for other elements. In the list below they are marked with an asterisk. Same as 'none', but in the collapsing border model, also inhibits any other border (see the section on border conflicts). The border is a series of dots. The border is a series of short line segments. The border is a single line segment. The border is two solid lines. The sum of the two lines and the space between them equals the value of 'border-width'. The border looks as though it were carved into the canvas. The opposite of 'groove': the border looks as though it were coming out of the canvas. In the separated borders model, the border makes the entire box look as though it were embedded in the canvas. In the collapsing border model, drawn the same as 'ridge'. In the separated borders model, the border makes the entire box look as though it were coming out of the canvas. In the collapsing border model, drawn the same as 'groove'.